What’s new in artificial lift? Part 1: In this first of two monthly reports, the authors highlight innovations in beam/rod pumping, linear lift units, hydraulic piston pumps, hydraulic jet pumps, and more. There are probably as many ways to classify artificial lift systems as there are production engineers in the world. As a point of reference, we like to look back each year to Table 1, which we first published in this feature in May 2013. As indicated, we think it makes some sense to organize artificial lift systems into three categories: 1) pumpassisted systems; 2) fluid-assisted systems; and 3) flow enhancement techniques. Within these three categories, there are basically 11 types of lift technologies. In each category, there also exist unconventional or emerging technology types of lift. 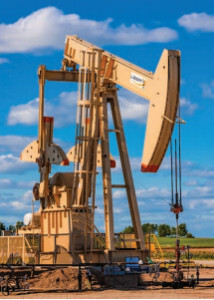 Although electric submersible pump (ESP) systems have surpassed beam/rod pumping as the fastest-growing technology in the artificial lift market, the latter is still the most common form of artificial lift found in oil fields today. The basic beam/ rod pump system consists of three components: a surface beam pump, a connecting rod string, and a downhole plunger pump. A new horse in town. 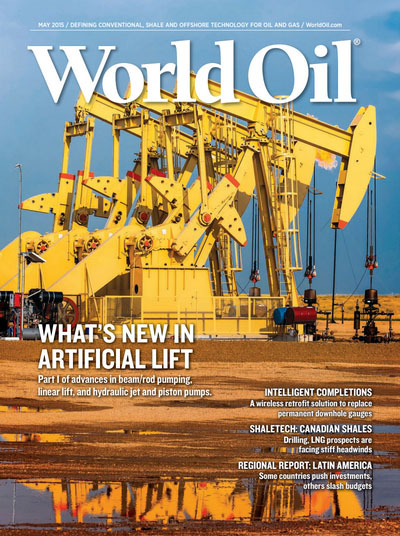 Liberty Lift Solutions is one of the newest innovators in the artificial lift world, offering a complete line of conventional and enhanced geometry, beam pumping units. The Liberty HE (high-efficiency) conventional pumping unit (Fig. 1) is far from conventional, based on the manufacturer’s claims of performance and ruggedness. The Liberty HE can be operated in either clockwise or counterclockwise rotation. When operated in the clockwise direction, the HE design devotes 186° of crank rotation to the upstroke, instead of the usual 180° with many other conventional units. This offers operational advantages. The longer upstroke duration adds more time for pump fillage, allowing the unit to perform more work than comparably sized conventional units. The HE design provides a perfect balance between the versatility of conventional geometry and the focused operation of special geometry. The company’s EG (enhanced geometry) pumping unit’s design maximizes efficiency and presents the user with a highperformance, durable and reliable unit. It is designed to achieve the optimum mechanical efficiency during the pumping cycle’s upstroke, devoting 192° of crank rotation when fluid is being lifted, and the pump is being filled. A slower upstroke reduces acceleration, lowering sucker rod forces and peak torque requirements. The EG unit’s larger polished rod load ranges can be handled without overloading the reducer. Contributing to this net torque reduction is the optimal counterbalance phasing. The optimized EG geometry and phase angle produce the maximum possible, permissible load range. More lifting and less horsepower equals “enhanced geometry.” In fact, permissible load in the upstroke is the maximum load that can be applied to the polished rod at any given crank position without causing torque overload. Permissible load in the downstroke is the minimum load that can applied to the polished rod, to prevent overloading when lifting counterbalance. Thus, permissible load range is a banded region that is the difference between the minimum permissible load during upstroke and the maximum permissible load during downstroke, which can be applied to a pumping unit without creating a torque overload. Both HE and EG structure bearings are high-capacity, energy-efficient anti-friction bearings, designed to provide trouble-free operation. The saddle bearings and equalizer bearing are rugged, double-row, tapered-roller bearings, requiring no operational adjustments. They can be lubricated from ground level. The wrist pin assemblies are designed using heavy-duty, double-row, and self-aligning, spherical roller bearings. As an added feature, bearings are shouldered on the wrist pin for easy maintenance. All structure bearings exceed API design requirements. Company designed and manufactured gear reducers provide continuous trouble-free operation and exceed all API requirements. The involute tooth gear form is a highly efficient, rugged and quiet means to transfer power. The course pitch design also assures that the gear reducer has the ability to withstand operational load fluctuations. All gears and pinions are doublehelical types and manufactured using a precision hobbing process, to assure a balanced loading and quiet operation. The pinions and low-speed shaft are made from quenched and tempered alloy steel, to promote the reducer’s long life. The high-speed gears and low-speed gear are made from ductile iron castings, then rough-machined and normalized to enhance durability. The bearings in the gear reducers are all oversized anti-friction bearings. This energy-efficient design can be rotated easily by hand. The gear reducer oiling system supplies ample lubrication to every reducer bearing, even at operating speeds of one stroke/ min. in either direction of rotation. The reducer’s exterior case is constructed of gray cast iron and is of the centerline split type. The structure designs of the HE and EG units exceed all API design requirements, and are licensed to carry the API monogram. Recent design developments by JJTech (with distribution and service support from Liberty Lift Solutions) combine the highly versatile Select-Jet pump with a virtually maintenance-free Hydra-Cell T-series diaphragm pump (from Wanner Engineering) into the Ultra-Flo system (U.S. Patent# 7,255,175), Fig. 9. The combined system makes the use of hydraulic jet pumps more attractive, since the surface pumps are not plagued by maintenance issues associated with conventional “packed” plunger pumps. The Select-Jet pump allows the operator to run in normal or reverse flow, without having to utilize a “sliding sleeve” and, most importantly, without having to pull the completion. The Select-Jet BHA is made from 17-4 PH stainless steel, to ensure maximum longevity. It also allows the operator to use downhole pressure gauges (pressure bombs) without requiring a slick-line to set/pull gauges. The pressure/ temperature recorder can be hydraulically set into, and retrieved from, the wellbore. Jet pump is hydraulically retrievable to the surface. Fig. 9. Ultra-Flo system with a T-Series diaphragm pump (inset). JJ-Tech also offers a line of tubingdeployed jet pumps that, according to the manufacturer, have the largest flow passages in the industry. They are reported to be ideal for high-volume wells and frac fluid recovery. 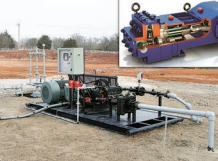 The company’s slim-hole jet pumps work well for gas well deliquification. Tubing options can be as small as a 1-in. integral joint inside 23/8-in. production tubing. These jet pumps are often run at 90° of inclination, far lower than one would run a conventional rod pump. The Hydra-Cell seal-less pump design eliminates VOC emissions, packing maintenance and plunger wear. It requires less routine maintenance and has the ability to handle corrosive and abrasive fluids. The pump can operate with a closed or blocked suction line and run dry indefinitely without damage, avoiding downtime and repair costs. Low NPSH requirements allow it to operate continuously with a vacuum inlet condition, so positive suction pressure is not necessary. This eliminates the need for a charge pump to the suction. The T80 series pumps are available in 3,000-, 3,500- and 5,000-psi models. Click here to access our interactive map with a complete listing of all Liberty Lift office and service locations within the United States. Equipped with necessary parts and experienced personnel, we are available 24/7 to provide installation, service and repair of our equipment and that of other manufacturers.